Booking too small a skip is annoying and adds additional time, stress and cost to your project. At Barna Recycling, we have developed this handy skip sizing guide to help you determine what skip you need. Our trained customer service team are also on hand to answer any specific questions you may have. Make sure you have enough flat, unobstructed space in your driveway for the skip you are hiring and that there is enough room to access your skip for dumping the waste. If you don’t have a driveway big enough for the skip you require, you can apply for a permit from your local authority. While a skip can be used to dispose of many types of unwanted materials, there are a number of items which cannot be placed in your rented skip. These items include but are not limited to the following; electrical items e.g. fridges, microwaves, fluorescent lights, asbestos, medical waste, oil, paint, solvents, gas bottles and any flammable hazardous or toxic materials. If it doubt, don’t hesitate to ask our skip delivery team or office based customer service team for clarification. For health and safety reasons, overflowing skips cannot be removed and transported from your property to the Barna Recycling waste management facility. Skips should be filled to the top and no further. To avoid other parties from placing items for disposal into your skip Barna Recycling have a number of skips available with security lids. If you have any further questions on skip hire, don’t hesitate to contact a member of our skip hire team on 091 771619. 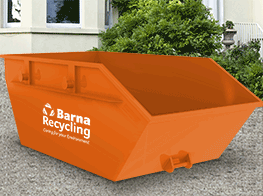 Barna Recycling offer a wide range of skips for hire across Galway, Roscommon, Mayo, Sligo and Leitrim.